All board members terms require a two year commitment to serve on the board in your elected position. This is currently a placeholder for the meeting. Confirmation of Time and Location are still required. This event is designed to show students how they can pursue their passion while making a difference in the world through a career at UnitedHealth Group. It brings together information about student programs, career opportunities, UnitedHealth Group’s businesses, and provides an opportunity to chat with the Talent Office team. The virtual environment is designed for attendees to “drop-in” as their schedule allows. Recruiters will be available during select hours. The NBMBAA Twin Cities Chapter will be hosting our membership meeting. At this event, the board will provide an overview of the last year, preview the next year, and complete elections for board roles that are open. The 40th Annual NBMBAA Conference & Exposition convenes our members, corporate and university partners, and some of the world’s most sought after thought leaders at the Cobo Center for a week of exploration in the areas of education, leadership, career opportunities, and networking connections that enable professional development. More than 10,000 professionals will travel to Detroit this September to gain access to opportunities that only our national conference can offer. Come learn more about the Leaders of Tomorrow Program at our back to school program information session. Feel free to drop in between 11 AM and 2 PM to learn about the program, ask questions, enjoy treats and games, and enter into a raffle for a gift card! Can’t attend? Send us an email at nbmbaa.lot.tc@gmail.com, and we can set up a time to share information about the program with you and your student. This event will be focused around professional development with topics catered to NBMBAA members. These attendees may consist of an audience of students, individuals with established careers, potential career switchers, and other interested groups in the Twin Cities. More details to come. Click here to register. Since its inception in 1991, the NBMBAA Leaders of Tomorrow (LOT) Program has mentored more than 8,000 talented youth aspiring to leadership roles in professional fields. 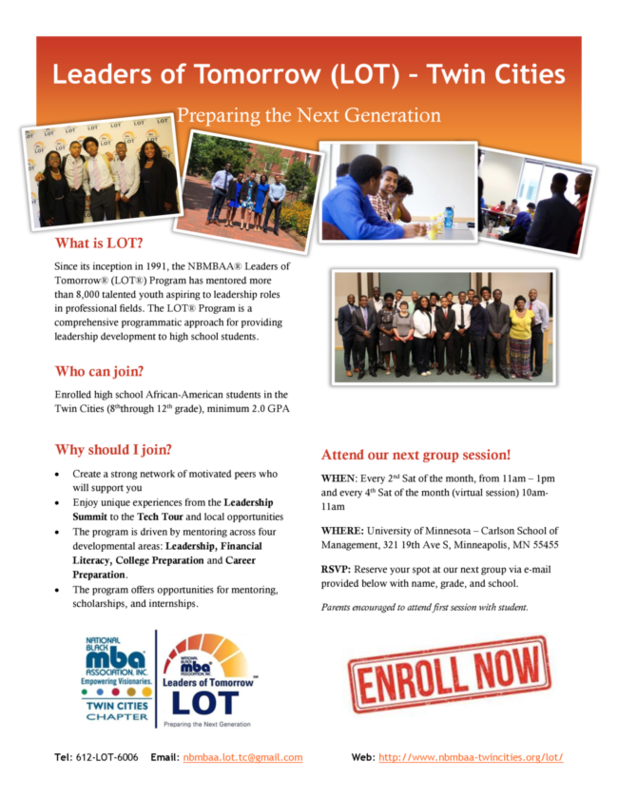 The LOT Program is a comprehensive programmatic approach for providing leadership development to high school students. Please join us for our Kickoff Session. For more information, email us at mailto:nbmbaa.lot.tc@gmail.com. MSP Mingle provides professionals of color with the opportunity to expand their networks and deepen relationships with members of the business community in a relaxed social setting. Join us at MSP Mingle hosted by the James J. Hill Center on Thursday, November 29 from 5:30 – 7:30 p.m. Free networking event! Guest speakers from the 2019 Minneapolis Final Four® Local Organizing Committee will highlight their initiatives to support diversity, equity, and inclusion in the community and share exciting news about how you can get involved! Black History Month Networking Soirée: "Evening of the Arts"
Join us on Thursday, February 21st at 5:30 PM for a sophisticated evening of African and African-American art, culture, and networking at the Black History Month “Evening of the Arts” – the 5th annual Twin Cities Black History Month Networking Soirée. Enjoy the elegant décor of the Reception Hall at the Minneapolis Institute of Art as you mingle with 250+ professionals from across Minneapolis and St. Paul. The evening will feature a keynote talk from visual artist, writer, and architect, James Garrett Jr, as well as free tours of the museum’s Black art collections, and much more. Hosted by the General Mills Black Champions Network and Medtronic in partnership with Cargill, Best Buy, Hennepin County, Boston Scientific, GMI DMCC, Ameriprise, Twin Cities Chapter of the National Black MBA Association, Twin Cities Chapter of the National Society of Black Engineers (NSBE TCPC). In partnership with NBMBAA, ALPFA, Ascend NAAMBA, PROSPANICA and BDPA Twin Cities Chapters, UnitedHealth Group will be leading a discussion on how you can pivot in your career. Our leaders will provide actionable insights to navigating career changes while helping you learn how to evaluate your skills and shift your professional brand as you make your career pivot a reality. In addition, you will have the opportunity to network with UnitedHealth Group employees and other professionals in the Twin Cities area. Come prepared to share your resume. Click here to RSVP. For more information about this event, see agenda below. Parking and location information: Attendees can enter the building via the parking garage, and may park at Building 1 Guest Parking: Garage A, Level 1 Guest Parking or enter through the front doors.